This guidance covers automatic plot registration in regards to the registration of leases. The registration of a lease, sub-lease, or assignation of an unregistered lease, will result in the plot of land to which the deed relates being registered. Where the plot of land is unregistered, an application to register such a deed will induce first registration of the owner's plot. The provisions of the Act as they relate generally to the registration of leases will be considered first. Automatic plot registration ("APR") and the other relevant provisions will then be considered in more detail. In order to be acceptable for registration a lease must be self-proving and must either be for a duration exceeding 20 years (i.e. 20 years and 1 day) or else contain an obligation on the granter to renew the lease so as to allow it to endure for a period in excess of 20 years. Under the Land Registration etc (Scotland) Act 2012 ("the Act") it is also a condition of registration that the deed to be registered is valid. The essential elements of a valid lease are that the parties, subjects, rent, and duration are stipulated. The Act makes certain amendments to the Registration of Leases (Scotland) Act 1857 ("the 1857 Act"). The main changes are set out at section 52 of the Act and include provisions relating to the effect of registration and whether certain deeds affecting registered leases are capable of registration. Section 52(2) confirms that where a deed is one that (a) terminates the lease, (b) extends the duration of the lease, or (c) otherwise alters the terms of the lease, it will be registrable in the land register. The primary duty of the keeper is to make up and maintain a title sheet for each registered plot of land. Once a plot of land is registered the subordinate real rights affecting that land will, in essence, flow from the plot title sheet. Accordingly, the Act does not require the keeper to make up a separate title sheet for a registered lease. Instead, the real right of the tenant and the landlord's ownership right may be entered on a single plot title sheet and a registered lease viewed in the same way as any other subordinate real right, such as a heritable security. The keeper has considered the implications of using single title sheets for both the landlord's and tenant's rights and determined that this could cause practical problems. For instance, where a number of leases relate to the same plot of land a single title sheet may become difficult to interpret, particularly where complex commercial leases are involved. Likewise, where the plot and the lease are both subject to a number of subordinate rights and encumbrances a single title sheet could become very lengthy. Section 3(2) gives the keeper discretion to create separate title sheets for registered leases and the keeper's policy is to continue to create separate lease title sheets. This should avoid the issues discussed above and provide certainty for applicants. The title sheet comprises of a property section, a proprietorship section, a securities section, and a burdens section. Sections 6 to 10 of the Act set out the basic information that must be contained in each section, including: a description of the plot of land, the name and designation of the proprietor (or tenant), any heritable securities, and any encumbrances. The property section must cross-refer to the title number of any other title sheet over the same area of land (eg the plot title sheet, any sub-lease title sheet, or a plot title sheet for minerals affecting the area). The securities section must not disclose any heritable securities affecting the plot of land, only those affecting the right of the particular tenant. The burdens section must disclose only the lease conditions and not any real burdens, servitudes or other registrable encumbrances affecting the plot of land. Where the lease title sheet relates to a sub-tenancy it must only contain the conditions of the particular sub-lease registered and not those of the head lease. For the purposes of entering in the property section of a plot title sheet the title numbers of any lease title sheets for that area of land, the keeper will include a schedule of leases. As the subjects of a lease do not fall within the definition of a plot of land for the purposes of the Act a cadastral unit cannot be created for a registered lease. The keeper will create a separate title sheet for the lease and link that title sheet to the cadastral unit for the plot of land. Section 11(1)(b)(iii) provides that the cadastral unit for the plot must show the title number of any registered lease relating to that unit. 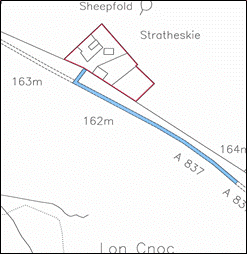 The conditions of registration state that, where within the plot there is a lesser area in respect of which a registrable encumbrance is constituted (including a long lease or sub-lease), the applicant must submit a plan or description sufficient to enable the keeper to delineate the boundaries of that lesser area on the cadastral map. 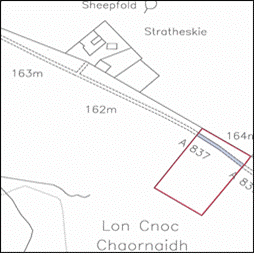 If the lease is over the whole of a registered plot no delineation on the cadastral map will be necessary. The requirement that the title number of the lease title sheet must be shown on the cadastral map, however, still applies. There is no requirement under the Act for any further information regarding a registered lease to be shown on the cadastral map. In circumstances where a registered lease contains rights of access within the larger plot of land or conditions specific to an area within the leased extent these will not be referenced on the cadastral unit. Instead, this information will be incorporated into the lease title sheet by reference to the deed plan in the archive record by virtue of section 10(3). The land register is a register of rights to land and the plot of land is the unit of registration. Once the plot of land is registered all rights to land, including subordinate real rights such as leases, stem from that registration and effectively become part of the land register at that time. Where the plot of land is unregistered an application to register a lease, sub-lease or assignation of unregistered lease will trigger automatic registration of the owner's plot of land (APR). All previously unregistered leases referred to in existing plot title sheets are deemed to be registered leases (see "Intervening leases" below). All previously unregistered leases over plots of land that are being registered for the first time are deemed to be registered leases in so far as no first registration of those leases is necessary. There will be instances during the transitional period following the designated day where lease title sheets created under the 1979 Act exist but where the owner's plot remains in the General Register of Sasines. Assignations affecting these registered leases will continue to be registrable against the existing lease title sheet without commencing APR of the owner's plot of land (it should, however, be noted that an application to register a sub-lease of a registered lease will> trigger APR in terms of section 24(4) where a lease title sheet exists). This is provided for as a transitional measure under article 6 of the Land Registration etc (Scotland) Act 2012 (Incidental, Consequential and Transitional) Order 2014 ("the Transitional Order") which inserts paragraph 11B into schedule 4 to the Act. The transitional period will continue until the sasine register is closed to all deeds. As a consequence of the plot of land being registered, and the deemed registration of any previously unregistered lease, any subsequent transaction over that lease must be treated as an application over a registered plot. For example, a standard security granted by the tenant must be submitted for registration in the land register even though the tenant's right was constituted in the sasine register. Section 26 sets out the conditions of registration for applications relating to registered plots of land. Section 26(1)(c) provides that the deed being registered must narrate the title numbers of each title sheet to which the application relates. If the lease, sub-lease or assignation of an unregistered lease does not narrate the title number of the plot of land the keeper must reject the application under section 21(3) because the applicant has failed to meet the registration condition set out in section 26(1)(c). If the plot is unregistered the application will induce APR of the landlord's plot under section 24(3) and the conditions contained in section 25 will apply. If the plot is registered then the deed must narrate the title number of the plot title sheet as the conditions contained in section 26 apply. If the plot is partly registered and partly unregistered the conditions contained in section 26 will apply in respect of the registered part and APR will be triggered for the unregistered part. In order to assist prospective applicants the plans report - level 3 will provide confirmation as to whether the deed being submitted for registration relates to an existing registered title. It will no longer be possible to register the deeds listed in section 24 of the Act unless the plot of land to which the deed relates is also registered. When such a deed is submitted for registration over an unregistered plot of land APR is triggered. Both the rights created or transferred in the deed and the relative plot must be registered, and the applicant must therefore provide all the deeds and information required for registration of the plot as well as their deed. Upon registration the keeper will create two title sheets, one for the plot of land and one for the registered lease. APR is required by the operation of sections 24, 25 and 30, and is not a measure to be used at the discretion of the keeper. When a deed listed in section 24 is submitted for registration the conditions contained in section 25 apply. Section 25(5) defines the "plot" to be registered in the different scenarios and the keeper is under a duty to make up a title sheet and create a cadastral unit for that "plot" under section 30(2). It is likely that the deeds listed at 1 to 3 above will be the most common triggers of APR. Until such time as the sasine register is closed to such deeds as listed at 6 above, applicants will have the choice of whether to record or register them. Section 48 makes provision for the phased closure of the Register of Sasines. It is no longer possible to record dispositions, standard securities, leases (including sub-leases), assignations of lease, or any other deed relating to a registered plot or registered lease, in that register. Further days may be prescribed for the closure of the Register of Sasines to other deeds. In relation to those “other deeds”, section 48(4) provides that on or after the prescribed day such deeds are registrable only in the land register. Deeds registrable by virtue of section 48(4) will become triggers for APR on the prescribed day. So, for example, should the Register of Sasines close to deeds of servitude an application to register such a deed over an unregistered plot will trigger registration of the area of land to which the deed relates. It is important to note that while the Register of Sasines is closed to standard securities an application to register a standard security over an unregistered plot will not induce APR. This particular type of deed is not subject to section 48(4) and consequently is not included as a trigger under section 24. Instead, an owner who wishes to grant a standard security will have to apply for voluntary registration of their plot of land prior to, or at the same time as, the standard security being registered. However, the Registers of Scotland (Voluntary Registration, Amendment of Fees, etc.) Order 2015 provides that the normal fee for voluntary registration is waived in circumstances where it is submitted along with an application for registration of standard security over the same subjects. When APR takes place the plot to be registered will not necessarily comprise the whole of the owner's title. Section 25(5) provides that the "plot" for APR purposes is to be the area of land forming, for example, the subjects of the lease. This means that where the leased subjects affect only part of the landlord's larger title the applicant is not then required to provide deeds and information relating to other parts of the larger title. However, there may be instances where the extent of the APR plot will be more extensive than the actual footprint of the leased unit. For example, where the tenant is granted a lease to a unit in a shopping centre they may also be granted a pro indiviso share in a common area. Since this is part of the subjects of the lease the APR plot will include this area. For the avoidance of doubt, where the lease includes rights of access within the shopping centre, or rights to use common services, such areas of land are not regarded as being leased and the extent of the APR plot is therefore restricted to the footprint of the leased unit. Where the plot to be registered as a consequence of APR is only part of the owner's larger title any rights of access in favour of the tenant within that larger title will not be reflected on the cadastral map. Such rights of access will be incorporated into the lease title sheet by reference to the lease plan in the archive record. For instance, in the scenario shown in figure 1 below, the keeper has registered a lease of the area edged red. Both the lease and plot title sheets are created to the same extent. The lease contains a right of access (shown tinted blue) over other land belonging to the granter of the lease. At this time the right of access is not equivalent to a servitude right since there are no burdened and benefited properties in separate ownership. This right will be entered in the lease title sheet by reference to the lease plan in the archive record. 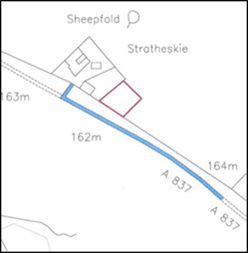 When the owner of the plot then sells off part of their plot, as shown edged red on figure 2 below, the right of access will not be apparent from the cadastral map. Therefore, when preparing the application for registration the applicant must have regard to the registered lease as it contains a right of access over part of the plot to be registered. The title number of the registered lease will be noted on the cadastral unit for the APR plot. A request for an extract or plain copy of a title sheet into which a deed in the archive record has been incorporated by reference will include a copy of that deed. Although there is no requirement for leasehold conditions or any rights of the tenant within the owner's larger plot to be delineated on the cadastral map it may be necessary to reflect on the cadastral map rights and encumbrances that affect the owner's title but fall outwith the APR plot extent. For example, in the scenario shown in figure 3 below, the keeper has registered a lease of the area edged red. The area leased forms part of the owner's larger title and APR is triggered in respect this smaller extent only. Both lease and plot title sheets are created to the extent of the area edged red. The owner's property benefits from the right of servitude access shown tinted blue. The APR plot edged red is physically remote from the route of the servitude yet still benefits from it. In such circumstances the keeper will delineate the servitude right on the cadastral map notwithstanding that the area containing the servitude right and the APR plot are discontiguous. When submitting a deed for registration that triggers APR only one application form is required. Part A of the application form requests that the appropriate application type be entered, which in such instances will be “automatic plot registration”. When using the online form only those questions pertinent to the application type selected are available to answer. When a person submits an application to register a deed that induces APR the general application conditions contained in section 22 apply in addition to the registration conditions in section 25. In terms of section 22(1)(a) the onus is on the applicant to ensure the application is sufficient for the keeper to comply with her duties under Part 1 of the Act. This includes completing the component parts of the plot title sheet and updating the cadastral map. Therefore, the applicant must identify any rights affecting the APR plot, in terms of section 6(1)(b), and any encumbrances that affect in terms of section 9(1). Although by virtue of section 25(5) the plot to be registered by APR may not comprise the whole of the owner's title, it will be necessary to disclose in the plot title sheet any subsisting rights and real burdens affecting the larger title of which the APR plot forms part. However, any burdens that affect only a specific part of the larger title remote from the APR plot need not be disclosed. The applicant must establish whether the APR plot forms part of a benefited property in respect of a dual registered servitude or real burden. Such rights must be disclosed in the plot title sheet even where the APR plot does not constitute the whole of the benefited property. Any burdens created after the original grant of lease must also be identified in the application. For example, the deed inducing APR may be an assignation of a previously recorded lease. The applicant must establish whether any encumbrances were created in the period following that recording. In some cases this may involve obtaining all break-off dispositions from the owner's title to check for any rights that may encumber the APR plot. In accepting an application that induces APR the keeper will rely on the information submitted by the applicant. The applicant will certify certain matters on the application form and the keeper will not carry out any further investigations in this regard. In terms of section 111 the applicant is under a duty to take reasonable care to ensure that the keeper does not inadvertently make the register inaccurate by registering their application. Therefore, the applicant should be satisfied of the position prior to submitting the application. The duty of care is only breached where a lack of reasonable care is shown. It is useful to note that section 30(5) permits the keeper to enter a statement in the proprietorship section of the plot title sheet where the name or designation to be entered cannot be determined with reasonable certainty. Applicants must bear in mind that ownership of the plot of land may have changed since the recording of the lease upon which they are transacting. In circumstances where the applicant is unable to identify the current landlord they can note this in the further information section of the application form. This will allow the application to proceed albeit with the qualifying statement in the plot title sheet. Where such a statement is entered in the title sheet the keeper may limit or exclude warranty under section 75(1)(b). View a checklist of the matters that may require consideration when preparing an application that induces APR. For a transitional period following the designated day there will be a number of pre-existing lease title sheets that relate to unregistered plots of land. The APR provisions apply only to assignations of lease where both the lease and the plot are unregistered. Assignations of registered leases were intentionally excluded from the APR scheme in order to protect the efficiency of current processes, ensuring such deeds continue to be registered as straightforward applications over the lease title sheet. Section 26 only applies to applications that relate to registered plots and would therefore apply to an assignation of a previously recorded lease where the plot is registered. Where the tenant's right was constituted by recording in the Register of Sasines and the plot of land to which it relates is registered any transaction affecting that lease becomes registrable subject to the conditions in section 26. Since sections 24 and 26 do not apply where the plot is unregistered but a lease title sheet exists, a transitional measure is provided at paragraph 11B of schedule 4 to the Act (inserted by article 6 of the Transitional Order). Provided the assignation narrates the title number of the lease title sheet (and meets the other application and registration conditions) it will be acceptable for registration. A partial assignation of lease is an assignation of only part of the leased subjects. Section 3 of the 1857 Act sets out that it is lawful to assign a lease, in whole or in part, by assignation. As such, any reference in the Act to "assignation" can be taken to include "partial assignation". In many respects an application to register a partial assignation of lease will be treated in much the same way as a "full" assignation. For example, where both the plot of land and the lease are unregistered an application to register a partial assignation of that lease will trigger APR in terms of section 24(3). The keeper will create two title sheets (one for the partially assigned lease and one for the APR plot) and will create a cadastral unit to the extent of the part newly assigned for the registered plot. Where the lease was previously recorded in the sasine register and the plot is registered, the partial assignation is registrable against the plot title sheet. The keeper will create a title sheet for the partially assigned lease and update the cadastral map accordingly. The transitional provision at paragraph 11B of schedule 4 will also apply to partial assignations of lease. Where the plot of land is unregistered but a lease title sheet exists a partial assignation of that lease will be registrable against the lease title sheet and will not trigger APR of the plot. However, in these particular circumstances there are further considerations since only part of the existing leased subjects are being assigned. When completing registration of a full assignation, in general terms, the keeper is only required to update the proprietorship section of the lease title sheet. When completing registration of a partial assignation it will be necessary to create a new lease title sheet as well as updating the existing one. Create a new lease title sheet for the partially assigned lease. In accordance with the general policy for mapping leases the deed plan will be incorporated in the title sheet by reference to the partial assignation in the archive record. Amend the existing title sheet and title plan to reflect the new sub-divided extent. The amended plan will be included as supplementary data in the existing lease title sheet. In terms of section 11(1)(a), supplementary data in individual title sheets is distinct from registered geospatial data shown on the cadastral map. Section 52(2) of the Act amends the 1857 Act to make specific provision for the registration of certain deeds affecting registered leases including those that extend the duration of a registered lease and those otherwise altering the terms of a registered lease. Where the tenant's right was constituted by recording in the sasine register, and the plot to which it relates is registered in the land register, then a variation of that lease must be registered against the plot title sheet (subject to the conditions in section 26). There will, however, be circumstances during the transitional period where the reverse is true and the plot of land is recorded in the sasine register while a title sheet pertaining to the lease exists in the land register. Section 26 does not apply since the conditions relate only to registered plots, and a variation of registered lease is not a deed listed under section 24 as triggering APR. As such, a variation of lease (excepting those incorporating additional subjects) must be both recorded against the plot and registered against the lease. Section 52(2) also applies to deeds that vary registered leases to include additional areas of land (a "deed otherwise altering the terms of a lease"). Such deeds are treated by the keeper as a new grant of lease over the additional subjects and will be acceptable for registration provided (1) the essentials of a valid lease are identified (parties, rent, duration, property), (2) the deed is valid, and (3) the deed is registrable (i.e. the deed is self-proving and the remaining duration of the original lease is in excess of 20 years). Such variations of lease will trigger APR in terms of section 24(2) where the plot of land is unregistered. The plot to be registered when APR is triggered in these circumstances will comprise the original leased subjects plus the additional subjects as this combined geographical area is now regarded as the "subjects of the lease" in terms of section 25(5)(a). It should be noted that when a variation of lease which purports to incorporate additional subjects and vary other aspects of the original lease (such as altering the terms) is submitted for registration, but where the remaining duration of the original lease is less than 20 years, the keeper will accept the variation for registration but will only give effect to it in so far as it comprises a deed capable of registration (i.e. the deed will be registered to reflect those parts which affect the subjects already registered under the original lease but any additional subjects will not be incorporated into the lease title sheet and APR will not take place). Annex 1 contains examples that illustrate the registration outcomes in a number of scenarios in which a variation of lease may be submitted. Where a lease, assignation of an unregistered lease, or a sub-lease triggers APR, the keeper will create two title sheets - one for the plot and one for the lease or sub-lease. However, in certain cases there may be intervening levels of leasehold rights affecting a particular plot of land. For instance, there could be a head lease, sub-lease, and sub-sublease. If the deed triggering APR is the sub-sublease and the head lease and sub-lease were recorded in the Register of Sasines then, by virtue of the plot of land being registered, the head lease and sub-lease will become part of the land register. Using the discretion available under section 3(2), the keeper will make up a lease title sheet for the sub-sublease since it is the subject of the current application. In some instances there may be a large number of intervening leasehold rights requiring lease title sheets. The extents of the subjects leased on intervening levels may not be clear from the current application. The intervening leased extents may be greater than the extent of the sub-lease or sub-sublease being registered, meaning the APR plot would also have to be greater. Where the owner's title comprises a building that is on multiple levels, such as a shopping centre, there may be additional APR considerations where individual units are leased. If the owner's plot of land is unregistered and a lease is granted over a shop unit on the second floor, APR will be triggered over the owner's plot to the solum of the floor space of that leased unit. Since the shopping centre is in single ownership the Act does not permit the keeper to register the plot only to the extent of the floor space on the second floor level. When the previously recorded leases entered in the plot title sheet are subsequently transacted upon the deed being registered must narrate the title number of the plot title sheet. The diagram below is an elevation plan showing a cross-section of a multi-level building which is in single ownership and contains six leased units. An assignation of the unregistered lease of Unit 3 is submitted for registration. The keeper is bound in terms of the APR provisions to register the plot of land to the solum of the floor space of Unit 3 as shown below. This plot registration takes in all previously recorded leases within the area shown tinted blue in the diagram above, including the lease of Unit 5 and part of the lease of Unit 1. The Act only requires the keeper to register the APR plot to the extent of the deed submitted. In the case of a multi-level property this could lead to the owner's title being registered in a fragmented manner over a period of time across multiple title sheets. The owner would have to ensure that any deed granted by them during that period, for example a standard security over the whole property, narrates the title numbers relating to the APR plot title sheets as well as describing the unrecorded part of the title. Such a deed would require to be registered in both the land register and the sasine register. It is likely the number of applications affected by these provisions will be minimal. Firstly, the multi-level property must be in single ownership and, secondly, the owner's title to that property must be unregistered. If registered, any application to register a lease, sub-lease or assignation of lease will be governed by section 26 and not the APR provisions in sections 24 and 25. However, should the owners of such a property find themselves in the position outlined above the keeper would encourage them to consider applying for voluntary registration of their whole plot in order to avoid any potential difficulties. The keeper may create shared lease title sheets where an area of land is tenanted in common by the tenants of two or more registered leases by virtue of their tenancy under those leases, and those leases have title sheets. Although the facility exists, the keeper does not create shared lease title sheets at this time. The state guarantee of title by way of the keeper’s warranty is given either under section 73, when an application for registration is accepted, or section 74, when a plot of land is registered by APR or Keeper-induced registration. Under both these sections the keeper warrants that the title sheet is accurate in what it shows and is not inaccurate in so far as it omits something that ought to be included. The level of warranty available is the same whether granted under section 73 or section 74, the difference being that, in the former case, the keeper warrants to the applicant while in the latter warranty is given to the owner of the plot of land in question. For example, where the keeper accepts an application to register a lease that induces APR the tenant, as applicant, will receive warranty in respect of their lease title sheet under section 73(1). The landlord, as owner of the plot of land, will receive warranty in respect of their plot title sheet under section 74(1). In order to indicate that a title sheet has been created by virtue of the APR provisions the keeper will enter a note on the plot title sheets stating that warranty is granted under section 74. This may be relevant to any person subsequently dealing with the plot title sheet or to the holder of a heritable security brought forward to the plot title sheet from the register of sasines as a consequence of APR. In this instance, the security holder will not receive the benefit of warranty since, under section 74(1), warranty is only given to the owner of the plot of land. It does not necessarily follow that a limitation or exclusion of warranty in relation to the plot title sheet will result in a limitation or exclusion of warranty in relation to the lease title sheet, or vice versa. For example, the applicant could indicate on the application form that there has been a limitation on the examination of title that they have carried out. This may be because the landlord has refused to exhibit an unrecorded link in title. This won't necessarily affect the validity of the lease being registered, however, it may affect the accuracy of the information entered in the plot title sheet. The keeper may decide that it is appropriate to exclude warranty from the plot title sheet yet grant full warranty in respect of the lease title sheet. Where APR is triggered section 22(1)(a) places the onus on the applicant to ensure their application contains sufficient information to enable the keeper to make up a title sheet for the plot of land. In cases where the deed inducing APR is a lease the owner of the plot of land will be known to the applicant and the deeds required for creation of the plot title sheet should be made available to them. In certain circumstances - for example where the deed inducing APR is an assignation of an ultra-long lease constituted some years ago - it may be more difficult for the assignee to trace the current landlord. When creating a plot title sheet as part of an APR the keeper can, in terms of section 30(5), add a statement in the title sheet that the name or designation to be entered in the proprietorship section is not known or is not known with reasonable certainty. In such instances the applicant should indicate the position in the further information section of the application form and the inclusion of such a statement may result in an exclusion of warranty in the plot title sheet under section 75(1)(b). This would not, however, mean that warranty would be limited or excluded from the resultant lease title sheet. In terms of section 40(1), the keeper is under a duty to notify both the applicant and the granter of the deed when an application for registration is accepted. Where the application is accepted by virtue of APR the keeper must also, in terms of section 41(2), notify the proprietor of the plot. It is the keeper's general policy regarding notifications under the Act to issue these by electronic means only. However, this may not be appropriate in certain cases where APR has taken place. If, for example, the deed triggering APR is a lease, the landlord will be the granter and their details will therefore be entered on the application form, while in other scenarios the landlord may not have direct involvement in the application for registration and it may not be possible for an email address to be provided for them. In situations where no email address is available for notification the keeper will notify the proprietor by post to the last known address as disclosed in the deeds. As part of an email notification under section 40(1) the applicant and granter will also receive PDF versions of the lease and plot title sheets. Where an email address is available for the proprietor of the plot in an application that triggers APR the keeper will likewise include a PDF version of the plot title sheet as part of their email notification. Where an email address is not provided and the notification is made by post a copy of the plot title sheet will not be included. Section 41(2)(b) allows the keeper to notify "any other person the Keeper considers appropriate" in addition to the proprietor of the plot. While persons other than the proprietor may have an interest in a particular APR (such as the holder of an undischarged heritable security brought forward to the plot title sheet) the creditor information may at the time of application be out of date. Without mortgage roll numbers or other identifying references it is likely that any notification to an address shown in a recorded deed will be of no practical utility. Therefore, the keeper will only usually notify the proprietor of the APR plot under section 41(2). An advance notice is a notice that protects an intended deed between two or more parties for a period of 35 days. The notice protects the intended grantee against competing deeds registered within the protected period and against the granter being inhibited. In terms of section 56(1) an advance notice can be used where the intended deed relates to a registered or unregistered lease. In cases where the lease to which the intended deed relates is registered the advance notice must be entered in the application record. In cases where the lease to which the intended deed relates is unregistered the advance notice must be recorded in the sasine register. This is provided for in section 57(4), as amended by article 4 of the Transitional Order. Since a lease of sporting rights is a "grant of lease" in terms of section 24(2) it will be subject to the APR provisions in the same way as any other grant of lease. Therefore, where the owner's plot of land is unregistered, a lease of sporting rights will be registrable and will induce APR of the plot to the extent of the leased subjects. This is contingent on the rights having not been converted into a separate tenement by notice under the Abolition of Feudal Tenure etc. (Scotland) Act 2000. Realignment of rights may occur where a person acting in good faith is assigned a lease from a person shown in the lease title sheet as tenant but who is without a valid title. Section 88(3) sets out a number of conditions that must be met before realignment can occur, including the requirement that the subjects of lease have been in the possession of either the assigner, or a combination of assigner and assignee, openly, peaceably and without judicial interruption for a period of one year. If the conditions are met the rights of the parties will be realigned so that the register is not inaccurate in showing the good faith acquirer as registered tenant (see realignment of rights). In relation to the extinction of encumbrances through the realignment provisions it is worth noting that “encumbrance” as defined in section 91(4) does not include a lease. Therefore, if a lease with real effect is erroneously omitted from a plot title sheet realignment could not operate to render that lease extinct as it would with certain other encumbrances. The table below highlights; (1) certain scenarios in which a variation of lease to incorporate additional subjects may be submitted, and (2) the registration outcomes in terms of the Act.